Krabi Airport (KBV) is a small but high volume airport serving travelers coming from Europe, Singapore, Kula Lumpur and Bangkok. Flights come from a ½ dozen major carriers, full of tourists all bound for the unspoiled beaches and tropical islands of the region. That’s why Krabi Airport is the best place to secure your car before driving out to the beach. CarHirePhuket.com’s pick-up point is located within the airport compound, and after picking up the keys to your new car, you can be on the beach in just minutes. 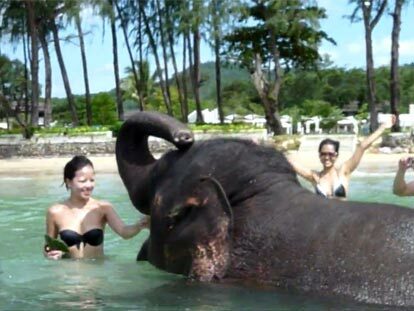 CarHirePhuket.com has the best selection of rental cars in the area, and offers models in all classes that will make any day in the sun that much more fun. Start now by entering your hire dates, review the best deals from top Thai rental companies, and pick up your car direct from Krabi Airport. Krabi Airport (KBV) shuttles over 800,000 travelers per year into the small town of Krabi with just over 80,000 residents. Located on Thailand’s Andaman seaboard, Krabi actually dates back to 25,000-35,000 BC, when Homo sapiens lived within the cliffs and in the caves above the white sanded shores. Today, Krabi is a jumping off point and rest area for all that love tropical islands and the beach. Within close proximity to numerous national parks, Krabi is indeed unspoiled — yet famous! Hat Noppharat Thara: This mostly water-based park has evergreen forests, mangroves, and peat swamp forests with excursions daily to explore wildlife undisturbed. Phi Phi Island: One of the most famous of the famous Thailand islands, Phi Phi has all the popular island attractions plus twin bays with long beautiful curved beaches. Su-san Hoi (The Shell Cemetery): Once a freshwater swamp, this area is now the habitat for a diverse range of sea mollusks all about 2 centimeters in size, with some slabs dating back approximately 40 million years. These limestone structures are some 40 centimeters thick and with past geographical upheavals, they are now distributed the limestone all along the seashore, so you can take a walk on the beach like no where else on earth. Hat Rai Le Beach: breathtaking huge limestone cliffs surround this beach, making it only accessible by sea. This world-class white sand beach is the longest in the area. It also is one of the most populated beaches both during the night and during the day. The east side of the beach is known as the ‘hippy’ hangout, while the west side is more posh and upscale. 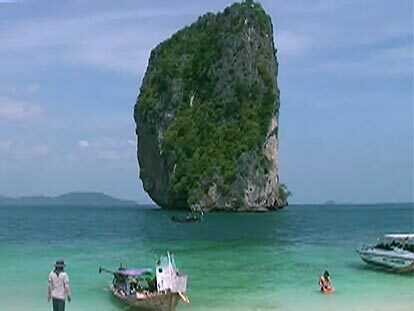 Check out Wikitravel’s Krabi page and 1StopKrabi’s Krabi travel Guide for more holiday and travel ideas.